Jackson Thomas preached this sermon, based on Isaiah 64 and Jeremiah 18, during Christival at Trinity Baptist Church, October 25, 2015. An audio version of the sermon may also be found online at Trinity’s website. Jackson Thomas serves as Youth Events Coordinator and Resident Artist at Trinity Baptist Church. We have a multi-faceted God who has many titles. Among these titles the Holy Trinity: God the Spirit who lives within us, God the Son who came and died for us and God the Father who sired all of creation. Still, perhaps one of the most relatable facets of God is God the Creator who carefully and artistically crafted all of creation. We acknowledge Him from time to time, but it seems we too often fail to fully appreciate and experience this facet of God. And it seems such a shame since we could so easily feel connected to this God, even more so, perhaps, than any other facet of God. In a mission trip to France I took recently, we were surrounded by the Alps. Everywhere we were in France, we saw them – brilliant and magnificent. It sounds like a cliché, but there is no way to capture the majesty that the mountains impress. That majesty is something man has been trying to reproduce for ages. Back in eras past, it was done through the mixture of art and architecture. The architecture of many buildings was meant to impress and inspire in the same way as the natural wonders of the world. We have an innate desire to connect with our Creator God and bring about the same wonder He did in the creation of the world. When I look at the beauty of the Alps or Niagara Falls, or look out over the ocean I see a level of beauty that would not be possible without a God with a sense of art and we, being made in His image, have been gifted with that same sense and a desire to express ourselves through that art. Despite these things, art is no longer in our everyday architecture. Christival gives us a month to recognize the art in worship, where it used to be an everyday part of worship. It seems such a shame because art is such a universal language. Art is appreciated across the globe, even if what different cultures see as art changes. This is true for all art though. Let’s take music for example. While traveling in France and Italy we had a number of these experiences, but the best I remember was in Belley. After the concert so many people came up and would – as best they could – express their gratitude and that, even though they didn’t know English – even though they couldn’t even understand the words of the message – the music really touched them. The message was clear to them even though the language barrier existed and, in that moment of truth, the barrier was broken. It was an amazing experience to see how the music could be used as a conduit for the universal message of Christ’s love. Isaiah 64:8 says “. . . we are the clay, you are the Potter”; and Jeremiah’s prophecy states that Israel is like clay in God’s hand: “Can I not shape you how I please?” God asks. I love this imagery. Working with clay is not an easy task. Many things can go wrong almost to the point where it seems a more apt analogy could have been made with almost any other form of art. However, these prophecies choose to use pottery to illustrate the love and care God must put into making each single person. This image implies care and painstaking amounts of work to make a piece of art exactly as we are to be made. It paints a picture of God not only as a father, siring man and then guiding us towards our destiny, but also as a careful constructor controlling every aspect of our creation – designing us to reach our potential way before we were even born. So, in a way, by being an artist is a way of participating in the glorious act of creation. It is perhaps the purest form of worship. True art is inspired by the spirit of God. It is imbedded in our soul. Every Sunday we utilize art for worship in the form of song, but all art should be utilized. Drawings, paintings, sculptures, writing stories, every type of art we can produce is a reflection of God within us. Every bit of art can be a testament of God’s glory, and this is true even of so-called “secular” art. To say that art cannot be used for Christ if it is created by someone who did not feel led by the Christian spirit is to undermine the power of God’s love and the relevance of art in Christian ministry. Art itself is a conduit of God’s presence in us, whether it is recognized as such or not. True art has underlying spirituality to it regardless of the artist. We can call the moving of the Holy Spirit anything we wish and can even explain it in such a way that it seems to take the godhood out of it. But inspiration was once thought to come from the muse. Now it is simply inspiration or maybe divine intervention or some other longing from within. All of these movements are movements of the Spirit, regardless of whether we, as humans who have very little understanding of the spiritual, classify it as such. Perhaps the ancient Greeks were more correct that the science we currently “understand”. Perhaps there are some messengers of God coming down and filling us with inspiration. Maybe there are still angels among us every day and we simply no longer recognize them. Without a spiritual movement, how do we actually explain what causes inspiration? Why does Chaucer’s use of words – English words that we hear every day – inspire us any more than everyday conversation? Why are we inspired by grand mountains when we stand on a much larger piece of land? Why do certain frequencies that we probably hear over and over again, arranged in a particular pattern become music to us? There is an aesthetic aspect to art that should not be overlooked because we have an instinctive desire to make that aesthetic please us and yet there is no apparent reason why it should unless we are created with an artistic mindset. And adults are not the only ones who understand and appreciate art. In fact, it often seems children grasp the concepts of art much more quickly than adults. Perhaps it is the gift of a still in-tact imagination. Regardless what this means is that artistry must be instilled at birth. and it gives us a mindset with which to approach worship. Art is a glorious link that God gave us to bind us with the spiritual realm, since art cannot exist without a spiritual movement within the artist. Art is a glorious way to glorify our Creator, and any art that is made with that spiritual movement – whether it is recognized or not – is spiritual in nature and is glorifying to God. So what does this mean for us as Christians? Better yet, what does it mean for us as artists? Surely we can’t be expected to draw only crosses or paint only pictures of the acts of the apostles. Our music must be more than hymns. Diversity is the spice of life after all. The only thing, really, we can be expected to do is create. Create not what we think is glorifying to God, but instead letting that spiritual movement happen within us. Take a quiet moment to reflect on life and let that image take form. Listen to the silence and hear the symphony moving within you. Then put that image to paper or sculpture or whatever other form it must take. Take the message that has been forming within you and write it down. Take an instrument and play that melody, or even put it on paper. I truly believe that every person is an artist, because we are created as artistic beings by an artistic God. We understand art because it was instilled in us. Not everyone is a painter or an illustrator. Not everyone is a singer or a songwriter. Your art may not even fall under a classic definition of what art is. But Sir Isaac Newton was inspired to make his discoveries on momentum. Albert Einstein advanced our understanding of Physics. By looking just so, you can realize that all things are art, because all of creation is a magnificent piece of art. And art as we understand is our invitation to take part in Creation. It is God allowing us to see a bit of His perspective – allowing us to understand that we are perfect creations he hand-crafted just as we craft all of our artistic endeavors. 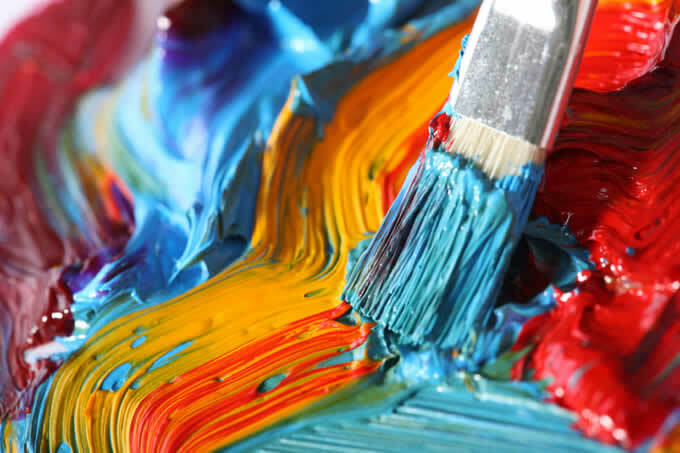 And just as an artist works diligently and tirelessly making every corner just so and every part of the painting the exact image he expects it to be, God has diligently and tirelessly made each and every person with all of our unique eccentricities. Each quirk was hand-designed by God to tell some story. Because as God’s artwork, we are more than just a sculpture, or a painting; we are characters in the story of the universe. God is the epitome of what it is to be an artist. He is more than just a sculptor, He is a writer, writing the story of each and every person. He is a musician. If you never have, listen some time to the sound of nature. The birds are obvious, but the sound of wind blowing through channels made my trees and the rustles of their leaves and the chatters of small animals and the percussion of falling acorns – all of these are part of a great orchestra created by God, singing His praises. It is the rocks crying out to worship their Creator in the moments where we are silent. It is the muse desperately calling out to the artist on all of us. God created the science we study to work in the way it does so that each new discovery can be just as exciting as the one before. All of creation reaches out to man to make us want to learn more about this universe in which we live. The grandiosity of creation brings out a longing in all mankind to understand it in some small way, be it through images or words or science; that is the grand design behind creation. That is the Creator God beckoning us. It is, after all, His Majesty’s palette.